Today I have a small set for you. It was inspired by a Chesterfield bed I saw and fell in love with. I used the repository technique a lot in this set. 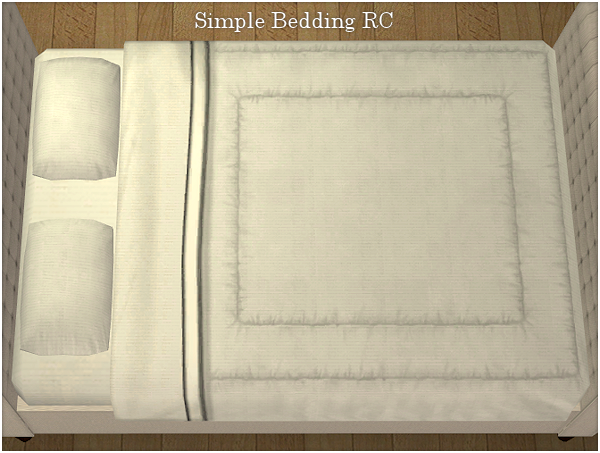 The single bed is slaved to the double bed so you need that in game for the single to show up. The patterned blanket is slaved to Jonesi's wonderful blanket so any recolors you have of it will show up on this one as well. I included her mesh for convenience. The pillows at the head of the bed are slaved to both Jonesi's blanket and Eaxis bedding. The small slumpy pillow is slaved to Jonesi's blanket and the blanked over the end of the bed and the pillow resting on it are also slaved to both Jonesi's blanket and Eaxis bedding. I told you it was a lot, but no worries! I included all the meshes you need for everything to work. Just plop these into your downloads folder and away you go. 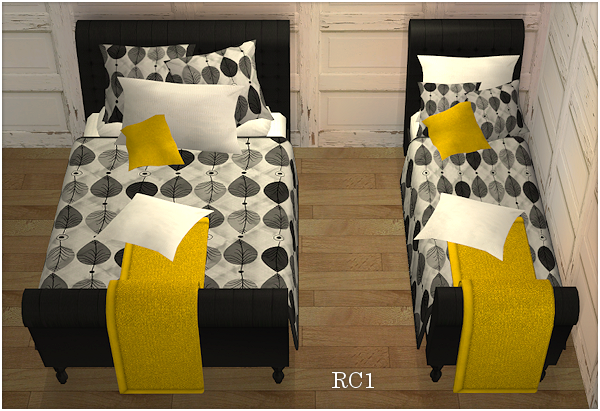 I also made a simple bedding recolor to go with the set. Everything is already at the perfect height so there are no needs for OMSPs, just make sure you have "move_objects on". Everything should be base game compatible. 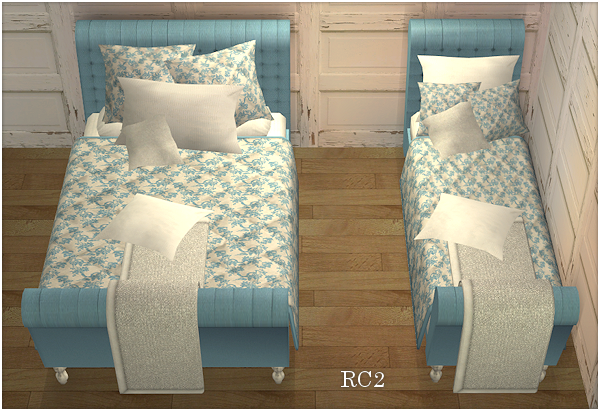 I included the UVmap for the bed and a collection file for those who might want them. That bed is simply gorgeous! Thank you! Wow what a pretty set! So sad cause they are so gorge! I'm sorry you are having such trouble with them. The beds are the same poly counts as most Eaxis beds so they shouldn't slow down your computer. I have had no problems with them and my computer is a few years old. I also haven't heard any other complaints about them. Make sure they are really the cause of your game slowing down and not some other piece of cc. Usually hairs are the bad doer in my game since they tend to be really outrageously high in polys. Remember to clear you .cache files as well. Thank you so much, they're beautiful! Hey~ I'm not sure if you still check this, but - I'm also having trouble with these. I had issues in a house where I put one of the beds, the sims kept resetting themselves and this happened after I downloaded these (along with nearly all your other sutff, which are amazing by the way). After separating my whole downloads folder I ended up finding out that yes, they are the problem. 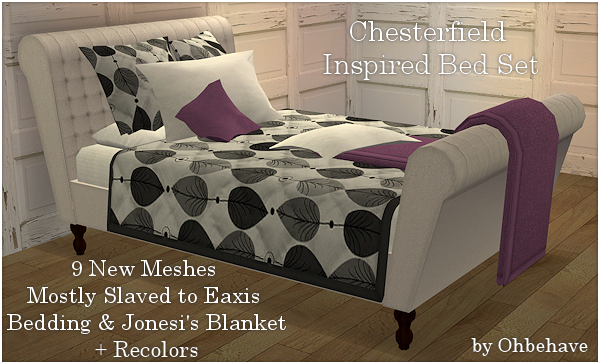 More specifically, the meshes for the beds. 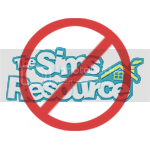 I'm no modder so I don't know what could possibly be wrong, but they are making sims reset themselves when put in a house. I really don't know why you are having trouble. Maybe they have a conflict with one of your other objects (same guid number). I'm pretty sure they are base game compatible but maybe not. That might cause trouble as well. I will take a look and see if there is anything that I can do to solve the problem. But like I said I will check the packages and see if there is something in there that might shed some light on the problem. And thank you very much for your time and patience. I haven't found anything yet but I will keep looking. I really wish I knew where to even begin fixing this. I will keep looking and asking others that might now but for now I have no answer. These are beautiful. I love your work. Thank you. Thank you so much for sharing your work. This is beautiful. Is this a .simpack or .package ? These are .packages. Just a reminder, these are for Sims 2. A Sim 3 conversion can be found at the link at the top of the post. Thank you for these cute beds!